A chilling combination of stainless steel and acrylic, this beautiful Iced collection brings high design and impressive "stay cold" function to the party, both indoors and outdoors. The upper stainless steel servers get very cold with ice below, keeping food placed in them chilled for hours. Normal standard--Each piece(set)/polybag, inner box and export carton. 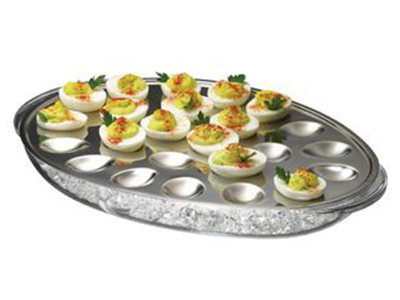 high quality stainless steel upper tray hold 24 deviled egg halved and rests on top of thick acrylic bottom ice tray. Place cubed or crushed ice in bottom tray and position upper egg tray on top, pushing it down so good contact is made with the ice. It keeps the eggs chilled for hours. The area for ice is large so your items will stay chilled for a long time before you might need to change the ice. It is great to keep the food cold!The compartments hold a good amount and the compartment for ice is great to keep the food cold! 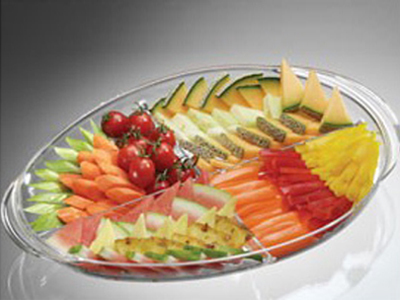 Bottom acrylic tray can also be used alone as a a beautiful four compartment serving platter. 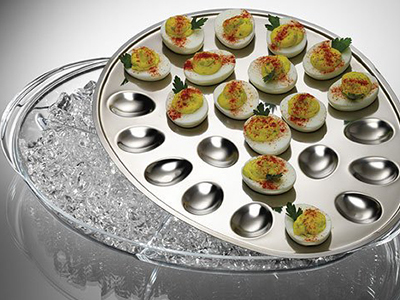 A chilling combination of stainless steel and acrylic, this beautiful egg platter brings high design and impressive stay clod function to the party. It keeps the eggs chilled for hours. CAUTION:Be careful when you place cold ice in the holder. This is a nice item to have. It looks elegant enough to have for big occasions. I received lots of compliments at my party. I ordered two. Very functional, easy to carry, nice shape. I would recommend to everyone. Must have item. I use it every time. 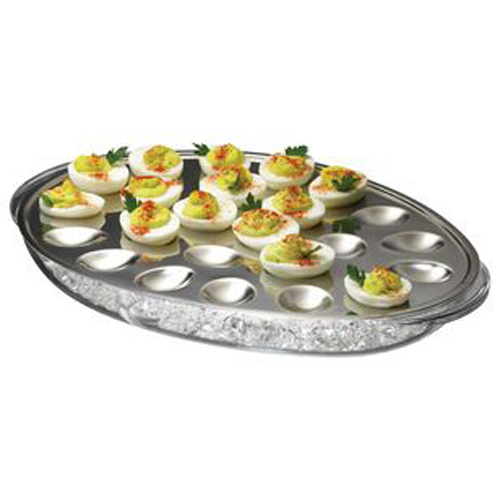 Works great, the ice tray held enough ice to keep the eggs cool for several hours.